Notes: Front Bench and Rear Bench. Includes Hog Rings, Hog Ring Pliers and Instructions. 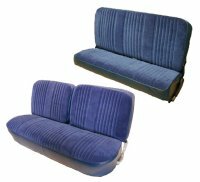 If you select Velour, the seating area will be made of Velour and will have Vinyl sides and skirts and the rear bench seat will be made in all Vinyl. This is replacement seat upholstery; not slip on seat covers.